Whether you just started your real estate blog recently and are trying to grow your web presence, or you have been faithfully blogging for years to capture more clients, you need to be aware of the impact of re-purposing your blog. If you want a fast, effective, easy way to boost your SEO, reach more customers, and improve your conversion rates, you need to recycle your old blog posts into valuable video content. Digital Marketing experts at companies like Help Marketing suggest recording yourself explaining the points of your blog posts in concise, clear videos to share with clients and prospects. It doesn't need to be anything fancy, as long as you get your points across. A smartphone or webcam will do just fine for recording purposes. Once you have recorded your videos, you need to use them; everywhere! Post and promote them on social sites like Facebook, Twitter, Pinterest and of course YouTube. Smaller points can also be used on SnapChat to reach younger buyers. Include those tips on your website and use them in emails to cement your relationship with your prospects. Hands down, video content is the most valuable form of online content. It is predicted that within the next three years video will be 70% of online content. Therefore, if you do not start producing your online video content now, you could be dead in the water by then. Video content helps your clients relate to you as a person while preserving the perception of you as an expert in your field. The best part of this whole process is that it can be done quickly, easily, and for little to no cost while yielding awesome returns. 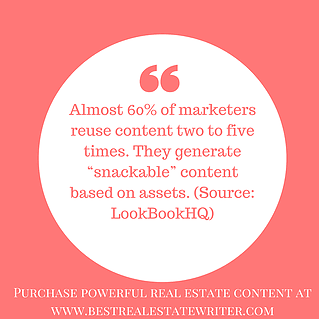 For more information on how to make the most out of every real estate blog post check out my course on real estate content marketing. 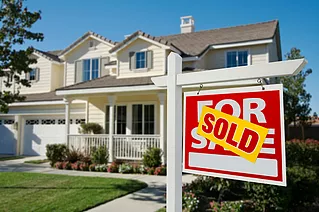 Want me to writer your real estate blog for you? Email me to apply.